This document specifies two profiles of [ TTML1 ]: a text-only profile and an image-only profile. These profiles are intended to be used across subtitle and caption delivery applications worldwide, thereby simplifying interoperability, consistent rendering and conversion to other subtitling and captioning formats. It is feasible to create documents that simultaneously conform to both [ ttml10-sdp-us ] and the text-only profile. The document defines extensions to [ TTML1 ], as well as incorporates extensions specified in [ ST2052-1 ] and [ EBU-TT-D ]. Both profiles are based on [ SUBM ]. This document was published by the Timed Text Working Group as a Recommendation. Comments regarding this document are welcome. Please file them in the github repository. A list of non-substantive changes applied since the Proposed Recommendation is found at changes-summary.txt. For convenience, a diff is offered at the W3C HTML Diff service. This specification defines two profiles of [ TTML1 ]: a text-only profile and an image-only profile. These profiles are intended for subtitle and caption delivery worldwide, including dialog language translation, content description, captions for deaf and hard of hearing, etc. The text profile is a syntactic superset of [ ttml10-sdp-us ], and a document can simultaneously conform to both [ ttml10-sdp-us ] and the text-only profile. This version of the specification makes editorial corrections and adds two optional features (6.7.5 ittp:activeArea and 6.7.6 itts:fillLineGap) over the Recommendation dated 21 April 2016. Processors and document instances that conform to the Recommendation dated 21 April 2016 also conform to this version of the specification. Sections 6.2 and 8.2 of [ TTML1 ] specify conventions used when specifying the syntax of attribute values, such as in 6.7 Extensions. All content of this specification that is not explicitly marked as non-normative is considered to be normative. If a section or appendix header contains the expression "non-normative", then the entirety of the section or appendix is considered non-normative. when making reference to processor conformance, these designations refer to processing requirements associated with each designated Feature or Extension. Default Region. See Section 9.3.1 at [ TTML1 ]. Document Instance. See Section 2.2 at [ TTML1 ]. Extension. See Section 2.2 at [ TTML1 ]. Feature. See Section 2.2 at [ TTML1 ]. Intermediate Synchronic Document. See Section 9.3.2 at [ TTML1 ]. Document Interchange Context. See Section 2.2 at [ TTML1 ]. Document Processing Context. See Section 2.2 at [ TTML1 ]. Linear White-Space. See Section 2.3 at [ TTML1 ]. Processor. Either a Presentation processor or a Transformation processor. Presentation processor. See Section 2.2 at [ TTML1 ]. Transformation processor. See Section 2.2 at [ TTML1 ]. Related Media Object. See Section 2.2 at [ TTML1 ]. Related Video Object. A Related Media Object that consists of a sequence of image frames, each a rectangular array of pixels. Root Container Region. See Section 2.2 at [ TTML1 ]. Text Alternative. As defined in [ WCAG20 ]. The key words MAY, SHALL, SHALL NOT, SHOULD, and SHOULD NOT are to be interpreted as described in [ RFC2119 ]. SHALL NOT include any vocabulary, syntax or attribute value associated with a Feature or Extension whose disposition is prohibited in the profile. A Document Instance, by definition, satisfies the requirements of Section 3.1 at [ TTML1 ], and hence a Document Instance that conforms to a profile defined herein is also a conforming TTML1 Document Instance. SHALL implement presentation semantic support for every Feature and Extension designated as permitted by the profile, subject to any additional constraints on each Feature and Extension as specified by the profile. MAY implement presentation semantic support for every Feature and Extension designated as optional by the profile, subject to any additional constraints on each Feature and Extension as specified by the profile. SHALL implement transformation semantic support for every Feature and Extension designated as permitted by the profile, subject to any additional constraints on each Feature and Extension as specified by the profile. MAY implement transformation semantic support for every Feature and Extension designated as optional by the profile, subject to any additional constraints on each Feature and Extension as specified by the profile. The use of the term presentation processor (transformation processor) within this specification does not imply conformance to the DFXP Presentation Profile (DFXP Transformation Profile) specified in [ TTML1 ]. In other words, it is not considered an error for a presentation processor (transformation processor) to conform to a profile defined in this specification without also conforming to the DFXP Presentation Profile (DFXP Transformation Profile). This specification does not specify presentation processor or transformation processor behavior when processing or transforming a non-conformant Document Instance. The permitted and prohibited dispositions do not refer to the specification of a ttp:feature or ttp:extension element as being permitted or prohibited within a ttp:profile element. Notwithstanding special cases, e.g. a Document Instance that contains no p, span, br element and no smpte:backgroundImage attribute, it is generally not possible to construct a Document Instance that conforms to the Text Profile and Image Profile simultaneously, and it is not possible to construct a Document Instance that results in the presentation of both text data and image data. In applications that require subtitle/caption content in image form to be simultaneously available in text form, two distinct Document Instances, one conforming to the Text Profile and the other conforming to the Image Profile, SHOULD be offered. In addition, the Text Profile Document Instance SHOULD be associated with the Image Profile Document Instance such that, when image content is encountered, assistive technologies have access to its corresponding text form. The method by which this association is made is left to each application. The ittm:altText element specified 6.7.4 ittm:altText also allows text equivalent string to be associated with an image, e.g. to support indexation of the content and also facilitate quality checking of the document during authoring. Annex D. WCAG Considerations specifically discusses this specification in the context of the [ WCAG20 ] guidelines. The Text Profile consists of Sections 6. Common Constraints and 7. Text Profile Constraints. The Image Profile consists of Sections 6. Common Constraints and 8. Image Profile Constraints. For the purpose of content processing, the determination of the resolved profile SHOULD take into account both the signaled profile, as defined in 6.9 Profile Signaling, and profile metadata, as designated by either (or both) the Document Interchange Context or (and) the Document Processing Context, which MAY entail inspecting document content. If the resolved profile is not a profile supported by the Processor but is feasibly interoperable with the Text Profile, then the resolved profile is the Text Profile; otherwise, if the resolved profile is not a profile supported by the Processor but is feasibly interoperable with the Image Profile, then the resolved profile is the Image Profile. If the resolved profile is a profile supported by the Processor, then the Processor SHOULD process the Document Instance according to the resolved profile. If the resolved profile is neither Text Profile nor Image Profile, processing is outside the scope of this specification. If the resolved profile is undetermined or not supported by the Processor, then the Processor SHOULD nevertheless process the Document Instance using one of its supported profiles, with a preference for the Text Profile over the Image Profile; otherwise, processing MAY be aborted. A Document Instance SHALL use UTF-8 character encoding as specified in [ UNICODE ]. A Document Instance MAY contain elements and attributes that are neither specifically permitted nor forbidden by a profile. A transformation processor SHOULD preserve such elements or attributes whenever possible. Document Instances remain subject to the content conformance requirements specified at Section 3.1 of [ TTML1 ]. In particular, a Document Instance can contain elements and attributes not in any TT namespace, i.e. in foreign namespaces, since such elements and attributes are pruned by the algorithm at Section 4 of [ TTML1 ] prior to evaluating content conformance. For validation purposes it is good practice to define and use a content specification for all foreign namespace elements and attributes used within a Document Instance. The namespace prefix values defined above are for convenience and Document Instances MAY use any prefix value that conforms to [ xml-names ]. The namespaces defined by this specification are mutable [ namespaceState ]; all undefined names in these namespaces are reserved for future standardization by the W3C. A Document Instance SHOULD be authored assuming strict clipping of content that falls out of region areas, regardless of the computed value of tts:overflow for the region. As specified in [ TTML1 ], tts:overflow has no effect on the extent of the region, and hence the total normalized drawing area S(En) at 9.3 Paint Regions. A Document Instance MAY be associated with a Related Video Object. While this specification contains specific provisions when a Document Instance is associated with a Related Video Object, it does not prevent the use of a Document Instance with other kinds of Related Media Object, e.g. an audio object. Each intermediate synchronic document of the Document Instance is intended to be displayed on a specific frame and removed on a specific frame of the Related Video Object. When mapping a media time expression M to a frame F of a Related Video Object, e.g. for the purpose of rendering a Document Instance onto the Related Video Object, the presentation processor SHALL map M to the frame F with the presentation time that is the closest to, but not less, than M.
A media time expression of 00:00:05.1 corresponds to frame ceiling( 5.1 × ( 1000 / 1001 × 30) ) = 153 of a related video object with a frame rate of 1000 / 1001 × 30 ≈ 29.97. In typical scenario, the same video program (the Related Video Object) will be used for Document Instance authoring, delivery and user playback. The mapping from media time expression to Related Video Object above allows the author to precisely associate subtitle video content with video frames, e.g. around scene transitions. In circumstances where the video program is downsampled during delivery, the application can specify that, at playback, the relative video object be considered the delivered video program upsampled to is original rate, thereby allowing subtitle content to be rendered at the same temporal locations it was authored. The ittp:aspectRatio attributes allows authorial control of the mapping of the Root Container Region of a Document Instance to each image frame of the Related Video Object. // where int(s) parses string s as a decimal integer. the rectangular area has a height or width equal to that of the image frame. Otherwise, the Root Container Region of a Document Instance SHALL be mapped to the image frame in its entirety. An ittp:aspectRatio attribute is considered to be significant only when specified on the tt element. Region with xml:id="A" in the following document would be positioned 20% from the left edge of an image frame with an aspect ratio of 16:9, or 10% from the left edge of an image frame with an aspect ratio of 4:3. In other words, tts:extent, when present on the tt element, determines the size of "px" units relative to the Root Container Region. ittp:aspectRatio is independently used to map the Root Container Region to each image frame of the Related Video Object. The ittp:aspectRatio parameter effectively defines the display aspect ratio (DAR) of the root container, while the tts:extent style property on the root element effectively defines the storage aspect ratio (SAR) of the Root Container Region. As a result, when both tts:extent and ittp:aspectRatio are specified on the tt element, the effective pixel aspect ratio (PAR) of the Root Container Region is equal to the ratio of the DAR to the SAR. A 16:9 video program is authored to ensure adequate presentation on 4:3 display devices using a center-cut. Accordingly subtitle/captions are authored using ittp:aspectRatio="4 3", allowing the combination to be displayed on both 4:3 and 16:9 display devices while preserving both caption/subtitles content and the relative position of caption/subtitles with video elements. A playback system zooms the content of example (a) to fill a 21:9 display, perhaps as instructed by the user. The system elects to scale the Root Container Region to fit vertically within the display (maintaining its aspect ratio as authored), at the cost of losing relative positioning between caption/subtitles and video elements. The system described in (b) instead elects to map the Root Container Region to the video frame, maintaining relative positioning between caption/subtitles and video elements but at the risk of clipping subtitles/captions. A progressively decodable Document Instance is structured to facilitate presentation before the document is received in its entirety, and can be identified using ittp:progressivelyDecodable attribute. no element E1 explicitly references another element E2 where the opening tag of E2 is lexically subsequent to the opening tag of E1. An ittp:progressivelyDecodable attribute is considered to be significant only when specified on the tt element. If not specified, the value of ittp:progressivelyDecodable SHALL be considered to be equal to "false". A Document Instance for which the computed value of ittp:progressivelyDecodable is "true" SHALL be a progressively decodable Document Instance. A Document Instance for which the computed value of ittp:progressivelyDecodable is "false" is neither asserted to be a progressively decodable Document Instance nor asserted not to be a progressively decodable Document Instance. an element in body referencing region elements. In this case, Requirement 4 above is always satisfied. an element in body referencing style elements. In this case, Requirement 4 above is always satisfied. a region element referencing style elements. In this case, Requirement 4 above is always satisfied. a style element referencing other style elements. In this case, Requirement 4 provides an optimization of style element ordering within the head element. a ttm:actor element referencing a ttm:agent element. In this case, Requirement 4 provides optimization of metadata elements ordering within the document. a content element referencing ttm:agent elements using the ttm:agent attribute. In this case, Requirement 4 provides optimization of metadata elements ordering within the document. itts:forcedDisplay can be used to hide content whose computed value of tts:visibility is "visible" when the processor has been configured to do so via the application parameter displayForcedOnlyMode. If and only if the value of displayForcedOnlyMode is "true", a content element with a itts:forcedDisplay computed value of "false" SHALL NOT produce any visible rendering, regardless of the computed value of tts:visibility. The itts:forcedDisplay attribute has no effect on content layout or composition, but merely determines whether composed content is visible or not. Annex C. Forced content (non-normative) illustrates the use of itts:forcedDisplay in an application in which a single document contains both hard of hearing captions and translated foreign language subtitles, using itts:forcedDisplay to display translation subtitles always, independently of whether the hard of hearing captions are displayed or hidden. The presentation processor SHALL accept an optional boolean parameter called displayForcedOnlyMode, whose value MAY be set by a context external to the presentation processor. If not set, the value of displayForcedOnlyMode SHALL be assumed to be equal to "false". The algorithm for setting the displayForcedOnlyMode parameter based on the circumstances under which the Document Instance is presented is left to the application. As specified in [ TTML1 ], the background of a region can be visible even if the computed value of tts:visibility equals "hidden" for all active content within. The background of a region for which itts:forcedDisplay equals "true" can therefore remain visible even if itts:forcedDisplay equals "false" for all active content elements within the region and displayForcedOnlyMode equals "true". Authors can avoid this situation, for instance, by ensuring that content elements and the regions that they are flowed into always have the same value of itts:forcedDisplay. Although itts:forcedDisplay, like all the TTML style attributes, has no defined semantics on a br content element, itts:forcedDisplay will apply to a br content element if it is either defined on an ancestor content element of the br content element or it is applied to a region element corresponding to a region that the br content element is being flowed into. It is expected that the functionality of itts:forcedDisplay will be mapped to a conditional style construct in a future revision of this specification. The presentation semantics associated with itts:forcedDisplay are intended to be compatible with those associated with the forcedDisplayMode attribute defined in [ CFF ]. ittm:altText allows an author to provide a text string equivalent for an element, typically an image. This text equivalent MAY be used to support indexing of the content and also facilitate quality checking of the document during authoring. The ittm:altText element SHALL be a child of the metadata element. 8. Image Profile Constraints specifies the use of the ittm:altText element with images. In contrast to the common use of alt attributes in [ HTML5 ], the ittm:altText attribute content is not intended to be displayed in place of the element if the element is not loaded. The ittm:altText attribute content can however be read and used by assistive technologies. The Active Area of a Document Instance is the area within the Root Container Region that the author intends to be minimally visible to the viewer. This area typically fully contains all of the referenced regions within the Document Instance. Under normal circumstances, the entirety of the Root Container Region is presented. However, under special circumstances, such as when the related video object is cropped, a system can, for instance, use the ittp:activeArea parameter to avoid cropping areas of the Root Container Region that are intended to be visible to the viewer. The specific behavior of the system is however left undefined intentionally: the system can select a presentation mode appropriate to the display shape, user preferences, etc. The ittp:activeArea is analogous to the Active Format Description (AFD) metadata commonly used in broadcast applications. The Active Area is specified using the ittp:activeArea attribute. : <percentage>                // where <percentage> is non-negative and not greater than 100%. The width percentage value is relative to the width of the Root Container Region. The height percentage value is relative to the height of the Root Container Region. The width and height percentage values are the width and height of the Active Area. The leftOffset and topOffset percentage values specify an alignment point between the root container and the Active Area. The use of left and top offset positions is co-incident with the [ css3-background ] background-position property where a two percentage value position is used. The syntax of the ittp:activeArea parameter is such that the Active Area cannot extend outside the Root Container Region in any dimension. The ittp:activeArea attribute is considered to be significant only when specified on the tt element. If the ittp:activeArea attribute is not specified, the Active Area SHALL be the Root Container Region. The itts:fillLineGap attribute allows the author to control the application of background between successive line areas. If itts:fillLineGap="true" then the background of each inline area generated by descendant spans of the p element SHALL extend to the before-edge and after-edge of its containing line area (before-edge and after-edge are defined at Section 4.2.3 of [ XSL11 ]). In the following example, the p specifies itts:fillLineGap="true", and, as a result, no gap exists between its lines. Figure 1 Illustrative rendition of the example immediately above with itts:fillLineGap="true" removed (left) or preserved (right). Blue lines have been added to show the before-edge and after-edge of each line area, which are coincident for successive line areas. Also, as illustrated in the following example, because the line areas of successive p elements are contiguous, no gap exists between two successive p elements where itts:fillLineGap="true". <style xml:id="paragraphStyleNoGap" tts:fontFamily="monospaceSerif" tts:textAlign="center" tts:fontSize="200%"
<style xml:id="paragraphStyle" tts:fontFamily="monospaceSerif" tts:textAlign="center" tts:fontSize="200%"
Figure 2 Illustrative rendition of the example immediately above, where itts:fillLineGap="true" on the two paragraphs of the top region, itts:fillLineGap="false" on the two paragraphs of the bottom region. either (a) content is selected into the region or (b) the computed value of tts:showBackground is equal to "always" and the computed value of tts:backgroundColor has non-transparent alpha. All regions SHALL NOT extend beyond the Root Container Region, i.e. every coordinate in the set of coordinates of each region is also in the set of coordinates of the Root Container Region. No two presented regions in a given intermediate synchronic document SHALL overlap, i.e. the intersection of the sets of coordinates within each presented region is empty. The number of presented regions in a given intermediate synchronic document SHALL NOT be greater than 4. Multiple other ebuttm:conformsToStandard elements can be present in addition to the two recommended above, indicating simultaneous conformance to profiles defined in other specifications, including future versions of this specification. the Document Instance also conforms to [ ttml10-sdp-us ], in which case the ttp:profile attribute is not present and the ttp:profile element is present, as illustrated in I.3 SDP-US. The ttp:profile and ebuttm:conformsToStandard elements SHALL NOT signal conformance to both Image Profile and Text Profile in a given Document Instance. It SHALL be possible to apply the Hypothetical Render Model specified in Section 9. Hypothetical Render Model to any sequence of consecutive intermediate synchronic documents without error as defined in Section 9.2 General. See 4. Conformance for a definition of permitted, prohibited and optional. #cellResolution permitted If the Document Instance includes any length value that uses the c expression, ttp:cellResolution SHOULD be present on the tt element. #extent-root permitted If the Document Instance includes any length value that uses the px expression, tts:extent SHALL be present on the tt element. #frameRate permitted If the Document Instance includes any clock time expression that uses the frames term or any offset time expression that uses the f metric, the ttp:frameRate attribute SHALL be present on the tt element. #length-cell permitted c units SHALL NOT be present outside of the value of ebutts:linePadding. #presentation permitted See constraints applied to #profile. #profile permitted See 6.9 Profile Signaling. #tickRate permitted ttp:tickRate SHALL be present on the tt element if the document contains any time expression that uses the t metric. NOTE: [ TTML1 ] specifies that the default timebase is "media" if ttp:timeBase is not specified on tt. All time expressions within a Document Instance SHOULD use the same syntax, either clock-time or offset-time. For any content element that contains br elements or text nodes or a smpte:backgroundImage attribute, both the begin attribute and one of either the end or dur attributes SHOULD be specified on the content element or at least one of its ancestors. #transformation permitted See constraints at #profile. #zIndex permitted NOTE: While permitted, this feature has no effect since, as specified at 6.8.2 Dimensions and Position, regions do not overlap in a Document Instance. #activeArea optional NOTE: This feature is optional such that a processor that conforms to the earlier version of this specification also conforms to this version. As specified in [ TTML1 ], a #time-offset-with-frames expression is translated to a media time M according to M = 3600 · hours + 60 · minutes + seconds + (frames ÷ (ttp:frameRateMultiplier · ttp:frameRate)). As specified in 6.11 Features and Extensions, the presence of the ttp:profile attribute is not required by this profile. The profile designator specified above is intended to be generally used to signal conformance of a Document Instance to the profile. The details of such signaling depends on the application, and can, for instance, use metadata structures out-of-band of the Document Instance. A Document Instance SHOULD be authored using characters selected from the sets specified in B. Recommended Character Sets. #PCDATA content within p and span elements of a Document Instance SHOULD NOT include the TAB (U+0009) character. No presentation semantics are specified for the TAB (U+0009) character. When rendering codepoints matching one of the combinations of computed font family and codepoints listed in A. Reference Fonts, a processor SHALL use a font that generates a glyph sequence whose dimension is substantially identical to the glyph sequence that would have been generated by one of the specified reference fonts. This clause only applies to codepoints supported by the processor. See 7.2 Recommended Character Sets for codepoints that a processor is likely to encounter for various languages. When a content author sets a bounding box for a subtitle, they want to maximize the likelihood that the text will fit within it when displayed by the processor. If the processor doesn't use the specific font the content author had in mind, the font actually used might cause the text to grow in size so that it no longer fits in the bounding box. This is further compounded by differences in the way text wraps when a font has bigger glyphs, which might increase the number of lines used, and increased line spacing, which might also push some of the text outside the bounding box. To help ensure that things such as text size, line breaking, and line height behave as expected relative to the size of the bounding box set by the content author, the author can use one of the reference fonts defined by this specification. This specification requires processors to support one or more fonts with similar font metrics as reference fonts. Note that, however, the reference fonts as currently defined only cover characters used for a few writing systems – in particular, a subset of those based on Latin, Greek, Cyrillic, Hebrew, and Arabic scripts. Implementations can use fonts other than those specified in A. Reference Fonts. Two fonts with equal metrics can have a different appearance, but flow identically. The initial value of tts:color SHALL be "white". NOTE 1: This is consistent with [ ST2052-1 ]. NOTE 2: The named color "green" defined in [ TTML1 ] is equivalent to the RGB triplet #008000 and is not full luminance. For full luminance green, an author can specify the RGB triplet #00ff00ff or the named color "lime". #extent-region permitted The tts:extent attribute SHALL be present on all region elements, where it SHALL use px units or "percentage" syntax. In absence of specific instructions on the choice of font families, and in order to enhance reproducibility of line fitting, authors are encouraged to use the monospaceSerif or proportionalSansSerif generic font families, for which reference font metrics are defined at A. Reference Fonts. If the computed value of tts:fontFamily is "default", then the used value of tts:fontFamily SHALL be "monospaceSerif". NOTE: The term used value is defined in CSS 2.1, as normatively referenced by [ TTML1 ]. Linear white-space SHOULD NOT appear between components of the specified value of tts:fontFamily. #fontSize See individual disposition of #fontSize-anamorphic and #fontSize-isomorphic. #lineBreak-uax14 The processor SHALL implement the #lineBreak-uax14 feature defined in the TT Feature namespace. #lineHeight permitted As implementation of the "normal" value is not uniform at the time of this writing, tts:lineHeight SHOULD NOT be set to "normal" and SHOULD be explicitly specified such that the specified style set of each p element contains a tts:lineHeight property whose value is not assigned by initial value fallback. #origin permitted The tts:origin attribute SHALL use px units or "percentage" representation, and SHALL NOT use em units. 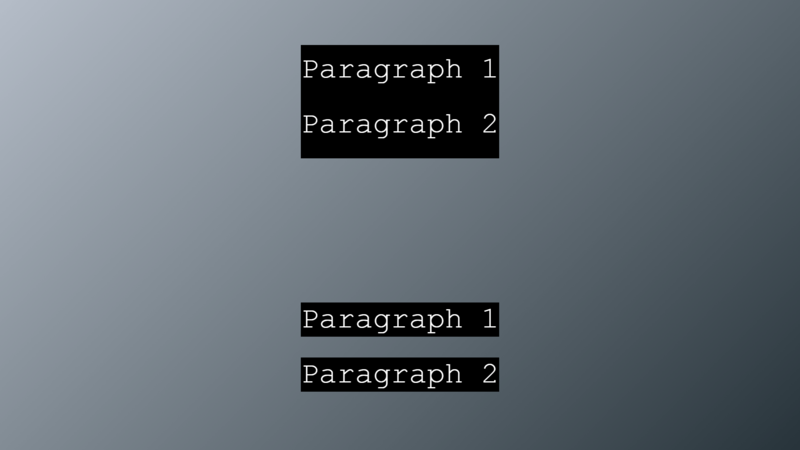 #textOutline permitted The computed value of tts:textOutline on a span element SHALL be 10% or less than the computed value of tts:fontSize on the same element. If used, the attribute ebutts:linePadding MAY be specified on elements region, body, div and p in addition to style. SHALL treat ebutts:linePadding as inheritable. NOTE: The ebutts:linePadding attribute only supports c length units. SHALL treat ebutts:multiRowAlign as inheritable. #fillLineGap optional NOTE: This feature is optional such that a processor that conforms to the earlier version of this specification also conforms to this version. In contrast to this specification, [ EBU-TT-D ] specifies that the attributes ebutts:linePadding and ebutts:multiRowAlign are allowed only on the style element. A presented image is a div element with a smpte:backgroundImage attribute that flows into a presented region. In a given intermediate synchronic document, each presented region SHALL contain at most one div element, which SHALL be a presented image. For the purposes of constructing an intermediate synchronic document, a div element with a smpte:backgroundImage attribute SHALL NOT be considered empty. The smpte:backgroundImage attribute SHALL reference a PNG datastream as specified in [ PNG ]. If a pHYs chunk is present, it SHALL indicate square pixels. Note that if no pixel aspect ratio is carried, the default of square pixels is assumed. In [ TTML1 ], tts:extent and tts:origin do not apply to div elements. In order to individually position multiple div elements, each div can be associated with a distinct region with the desired tts:extent and tts:origin. #backgroundColor See individual disposition of #backgroundColor-inline, #backgroundColor-region and #backgroundColor-block. #bidi See individual disposition of #direction, #unicodeBidi and #writingMode-horizontal. #content permitted The p, span and br elements SHALL NOT be present. See Section 8.2.2 Constraints for constraints on div elements. #extent-region permitted The tts:extent attribute SHALL be present on all region elements, where it SHALL use px units. #lineBreak-uax14 No processor requirement is specified. NOTE: The prohibition of span elements by this profile implies the prohibition of this feature. #visibility See individual disposition of #visibility-inline, #visibility-region and #visibility-block. #writingMode See individual disposition of #writingMode-vertical and #writingMode-horizontal. smpte:backgroundImage MAY be used according to 8.3 smpte:backgroundImage Constraints with the semantics of the attribute defined by Sections 5.5.2 of [ ST2052-1 ]. smpte:backgroundImageHorizontal and smpte:backgroundImageVertical SHALL NOT be used. smpte:image SHALL NOT be used. The rendering semantics of smpte:backgroundImage are not identical to those of background-image specified at Section 7.8.3 of [ XSL11 ]. In particular, Section 5.5.6 at [ ST2052-1 ] amends the semantics of background-image by specifying values for its min-height and min-width properties. This Section specifies the Hypothetical Render Model illustrated in Figure 3. The purpose of the model is to limit Document Instance complexity. It is not intended as a specification of the processing requirements for implementations. For instance, while the model defines a glyph buffer for the purpose of limiting the number of glyphs displayed at any given point in time, it neither requires the implementation of such a buffer, nor models the sub-pixel character positioning and anti-aliased glyph rendering that can be used to produce text output. The model operates on successive intermediate synchronic documents obtained from an input Document Instance, and uses a simple double buffering model: while an intermediate synchronic document En is being painted into Presentation Buffer Pn (the "front buffer" of the model), the previous intermediate synchronic document En-1 is available for display in Presentation Buffer Pn-1 (the "back buffer" of the model). The model specifies an (hypothetical) time required for completely painting an intermediate synchronic document as a proxy for complexity. Painting includes drawing region backgrounds, rendering and copying glyphs, and decoding and copying images. Complexity is then limited by requiring that painting of intermediate synchronic document En completes before the end of intermediate synchronic document En-1. Whenever applicable, constraints are specified relative to the dimensions of the Root Container Region, allowing subtitle sequences to be authored independently of Related Video Object resolution. To enable scenarios where the same glyphs are used in multiple successive intermediate synchronic documents, e.g. to convey a CEA-608/708-style roll-up (see [ CEA-608 ] and [ CEA-708 ]), the Glyph Buffers Gn and Gn-1 store rendered glyphs across intermediate synchronic documents, allowing glyphs to be copied into the Presentation Buffer instead of rendered, a more costly operation. Similarly, Decoded Image Buffers Dn and Dn-1 store decoded images across intermediate synchronic documents, allowing images to be copied into the Presentation Buffer instead of decoded. paint the text or image subtitle content. at the presentation time of En-1, if n > 0. DURI(En) is the duration, in seconds, for painting the image subtitle content for intermediate synchronic document En, as specified in Section . The contents of the Presentation Buffer Pn SHALL be transferred instantaneously to Presentation Buffer Pn-1 at the presentation time of intermediate synchronic document En, making the latter available for display. It is possible for the contents of Presentation Buffer Pn-1 to never be displayed. This can happen if Presentation Buffer Pn is copied twice to Presentation Buffer Pn-1 between two consecutive video frame boundaries of the Related Video Object. It SHALL be an error for the Presentation Compositor to fail to complete painting pixels for En before the presentation time of En. Unless specified otherwise, the following table SHALL specify values for IPD and BDraw. BDraw effectively sets a limit on fillings regions - for example, assuming that the Root Container Region is ultimately rendered at 1920×1080 resolution, a BDraw of 12 s-1 would correspond to a fill rate of 1920×1080×12/s=23.7×220pixels s-1. IPD effectively sets a limit on the complexity of any given intermediate synchronic document. where CLEAR(E0) = 0 and CLEAR(En | n > 0) = 1, i.e. the Root Container Region in its entirety. To ensure consistency of the Presentation Buffer, a new intermediate synchronic document requires clearing of the Root Container Region. where R_p SHALL be the set of presented regions in the intermediate synchronic document En. For a region Ri in with tts:extent="250px 50px" within a Root Container Region with tts:extent="1920px 1080px", NSIZE(Ri) ≈ 0.00603.
it is specified on a set animation element that is to be applied to content elements that are to be flowed into the region for presentation in the intermediate synchronic document (see [ TTML1 ] for more details on when a set animation element is applied to content elements). Even if a specified tts:backgroundColor is the same as specified on the nearest ancestor content element or animation element, specifying any tts:backgroundColor SHALL require an additional fill operation for all region pixels. The Presentation Compositor SHALL paint into the Presentation Buffer Pn all visible pixels of presented images of intermediate synchronic document En. otherwise, decode the image using the Image Decoder the image into the Presentation Buffer Pn and Decoded Image Buffer Dn. Two images SHALL be identical if and only if they reference the same encoded image source. ICpy is the normalized image copy performance factor. NSIZ(Ii) SHALL be the number of pixels of presented image Ii. The contents of the Decoded Image Buffer Dn SHALL be transferred instantaneously to Decoded Image Buffer Dn-1 at the presentation time of intermediate synchronic document En. The total size occupied by images stored in Decoded Image Buffers Dn or Dn-1 SHALL be the sum of their Normalized Image Area. The size of Decoded Image Buffers Dn or Dn-1 SHALL be the Normalized Decoded Image Buffer Size (NDIBS). Unless specified otherwise, the following table SHALL specify ICpy, IDec, and NDBIS. While one-to-one mapping between characters and typographical glyphs is generally the rule in some scripts, e.g. latin script, it is the exception in others. For instance, in arabic script, a character can yield multiple glyphs depending on its position in a word. The Hypothetical Render Model always assumes a one-to-one mapping, but reduces the performance of the glyph buffer for scripts where one-to-one mapping is not the general rule (see GCpy below). otherwise render using the Glyph Renderer the glyph into the Presentation Buffer Pn and Glyph Buffer Gn. GCpy is the normalized glyph copy performance factor. NRGA(Gi) does not take into account decorations (e.g. underline), effects (e.g. outline) or actual typographical glyph aspect ratio. 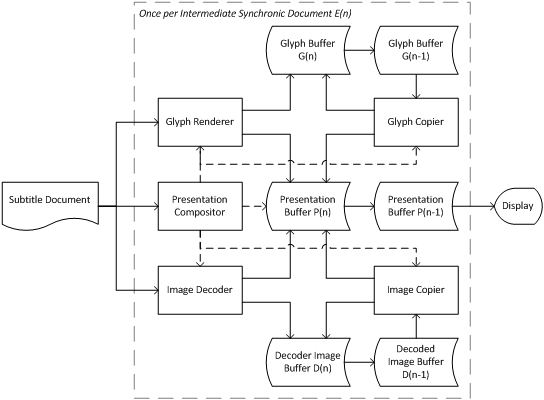 An implementation can determine an actual buffer size needs based on worst-case glyph size complexity. The contents of the Glyph Buffer Gn SHALL be copied instantaneously to Glyph Buffer Gn-1 at the presentation time of intermediate synchronic document En. It SHALL be an error for the sum of NRGA(gi) over all glyphs Glyph Buffer Gn to be larger than the Normalized Glyph Buffer Size (NGBS). Unless specified otherwise, the following table specifies values of GCpy, Ren and NGBS. The choice of font by the presentation processor can increase rendering complexity. For instance, a cursive font can generally result in a given character yielding different typographical glyphs depending on context, even if latin script is used. Setting a Normalized Glyph Buffer Size effectively sets a limit on the total number of distinct glyphs present in any given intermediate synchronic document En. For example, assuming a maximum Normalized Glyph Buffer Size of 1 and the default tts:fontSize of 1c are used, the font size relative to the Root Container Region height is 1/15 , and the maximum number of distinct glyphs that can be buffered is 1÷(1÷15)2=225 glyphs. GCpy effectively sets a limit on animating text. For example, assuming that the Root Container Region is ultimately rendered at 1920×1080 resolution and no regions need to have background color painted (so only a CLEAR(En) operation is required for the normalized drawing area for the intermediate synchronic document), a GCpy and BDraw of 12 s-1 would mean that a group of 160 glyphs with a tts:fontSize equal to 5% of the Root Container Region height could be moved at most approximately 12 s-1 ÷ (1 + ( 160 × 0.052 )) = 8.6 times per second. Ren(Gi) effectively sets a limit on the text rendering rate. For example, assuming that the Root Container Region is ultimately rendered at a 1920×1080 resolution, a Ren(Gi) of 1.2 s-1 would mean that at most 120 glyphs with a fontSize of 108 px (10% of 1080 px and NRGA(Gi) = 0.01) could be rendered every second. When authoring textual content, authors are encouraged to select from sets of characters based on the language indicated using xml:lang. The idea is to increase the confidence that the text will be presented correctly by implementations targeting specific locales. supplementary characters specified for the language in Table 2, if any. Some of these sets overlap. Table 1 captures the set of characters intended to be available to authors across all languages. The terms used in the table are defined in [ UNICODE ]. Table 1. Common Character Set. Table 2 specifies supplementary character set that have proven useful in captioning and subtitling applications for a number of selected languages. Table 2 is non-exhaustive, and will be extended as needs arise. Table 2. Supplementary Character Sets. Figure 5 below illustrates the use of forced content, i.e. itts:forcedDisplay and displayForcedOnlyMode. The content with itts:forcedDisplay="true" is the French translation of the "High School" sign. The content with itts:forcedDisplay="false" are French subtitles capturing a voiceover. When the user selects French as the playback language but does not select French subtitles, displayForcedOnlyMode is set to "true", causing the display of the sign translation, which is useful to any French speaker, but hiding the voiceover subtitles as the voiceover is heard in French. If the user selects French as the playback language and also selects French subtitles, e.g. if the user is hard-of-hearing, displayForcedOnlyMode is set to "false", causing the display of both the sign translation and the voiceover subtitles. The algorithm for setting the displayForcedOnlyMode parameter and selecting the appropriate combination of subtitle and audio tracks depends on the application. In order to meet the guidelines in [ WCAG20 ], the following considerations apply. Guideline 1.1 of [ WCAG20 ] recommends that an implementation provide Text Alternatives for all non-text content. In the context of this specification, this Text Alternative is intended primarily to support users of the subtitles who cannot see images. Since the images of an Image Profile Document Instance usually represent subtitle or caption text, the guidelines for authoring text equivalent strings given at Images of text of [ HTML5 ] are appropriate. Thus, for each subtitle in an Image Profile Document Instance, a text equivalent content in a Text Profile Document Instance SHOULD be written so that it conveys all essential content and fulfills the same function as the corresponding subtitle image. In the context of subtitling and captioning, this content will be (as a minimum) the verbatim equivalent of the image without précis or summarization. However, the author MAY include extra information to the text equivalent string in cases where styling is applied to the text image with a deliberate connotation, as a functional replacement for the applied style. For instance, in subtitling and captioning, italics can be used to indicate an off screen speaker context (for example a voice from a radio). An author can choose to include this functional information in the text equivalent; for example, by including the word "Radio: " before the image equivalent text. Note that images in an Image Profile Document Instance that are intended for use as captions, i.e. intended for a hard of hearing audience, might already include this functional information in the rendered text. Guideline 1.1 of [ WCAG20 ] also recommends that accessible Text Alternatives must be "programmatically determinable." This means that the text must be able to be read and used by the assistive technologies (and the accessibility features in browsers) that people with disabilities use. It also means that the user must be able to use their assistive technology to find the alternative text (that they can use) when they land on the non-text content (that they can't use). The following sample Document Instances conforms to the Text Profile and Image Profile, respectively. These samples are for illustration only, and are neither intended to capture current or future practice, nor exercise all normative prose contained in this specification. The following sections define extension designations, expressed as relative URIs (fragment identifiers) relative to the IMSC Extension Namespace base URI. A transformation processor supports the #progressivelyDecodable feature if it recognizes and is capable of transforming values of the ittp:progressivelyDecodable. A presentation processor supports the #progressivelyDecodable feature if it implements presentation semantic support for values of the ittp:progressivelyDecodable attribute. A transformation processor supports the #aspectRatio feature if it recognizes and is capable of transforming values of the ittp:aspectRatio. A presentation processor supports the #aspectRatio feature if it implements presentation semantic support for values of the ittp:aspectRatio attribute. A transformation processor supports the #forcedDisplay feature if it recognizes and is capable of transforming values of the itts:forcedDisplay. A presentation processor supports the #forcedDisplay feature if it implements presentation semantic support for values of the itts:forcedDisplay attribute. A transformation processor supports the #altText feature if it recognizes and is capable of transforming values of the ittm:altText element. A presentation processor supports the #altText feature if it implements presentation semantic support for values of the ittm:altText element. A transformation processor supports the #linePadding feature if it recognizes and is capable of transforming values of the ebutts:linePadding attribute specified in [ EBU-TT-D ]. A presentation processor supports the #linePadding feature if it implements presentation semantic support for values of the ebutts:linePadding attribute specified in [ EBU-TT-D ]. A transformation processor supports the #multiRowAlign feature if it recognizes and is capable of transforming values of the ebutts:multiRowAlign attribute specified in [ EBU-TT-D ]. A presentation processor supports the #multiRowAlign feature if it implements presentation semantic support for values of the ebutts:multiRowAlign attribute specified in [ EBU-TT-D ]. A transformation processor supports the #activeArea feature if it recognizes and is capable of transforming values of the ittp:activeArea attribute. A presentation processor supports the #activeArea feature if it implements presentation semantic support for values of the ittp:activeArea attribute. A transformation processor supports the #fillLineGap feature if it recognizes and is capable of transforming values of the itts:fillLineGap attribute. A presentation processor supports the #fillLineGap feature if it implements presentation semantic support for values of the itts:fillLineGap attribute. XML Schema definitions (see [ xmlschema-1 ]) for extension vocabulary defined by this specification are provided here for convenience. These definitions are non-normative and are not sufficient to validate conformance of a Document Instance. In any case where a definition specified by this appendix diverge from the prose of the specification, then the latter takes precedence. This section documents extensibility objectives for this specification. a document that conforms to Text Profile or Image Profile to be embedded in other XML documents. conforms to [ ST2052-1 ], and also conforms to Image Profile. This specification is also intended to allow straightforward conversion of a document that conforms to the text or image profiles of [ CFF ] to the Text Profile or Image Profile, respectively. The Text Profile is a strict syntactic superset of [ EBU-TT-D ]. [ EBU-TT-D ] does not constrain the number of presented regions in a given intermediate synchronic document. The ttp:profile attribute and element are not allowed by [ EBU-TT-D ]. The ebuttm:conformsToStandard element is used instead, as discussed at 6.9 Profile Signaling. It is not possible for a document that conforms to [ EBU-TT-D ] to also conform to Image Profile, and vice-versa, notwithstanding the special case where the document also conforms to Text Profile as noted at 5. Profiles. The Text Profile is a strict syntactic superset of [ ttml10-sdp-us ]. [ ttml10-sdp-us ] does not constrain document complexity using an HRM. [ ttml10-sdp-us ] requires a specific value of the use attribute of the ttp:profile. As a result, Text Profile is not signaled using the ttp:profile attribute. Instead, as specified in 5.4 Profile Resolution Semantics, the Text Profile can be signaled by the Document Interchange Context and/or the Document Processing Context. Alternatively, a processor can choose to process a document as a Text Profile document if the ttp:profile element signals [ ttml10-sdp-us ], since [ ttml10-sdp-us ] is feasibly interoperable with Text Profile. It is not possible for a document that conforms to [ ttml10-sdp-us ] to also conform to Image Profile, and vice-versa, notwithstanding the special case where the document also conforms to Text Profile as noted at 5. Profiles. As an illustration, Example 3 at [ ttml10-sdp-us ] conforms to both Text Profile and [ ttml10-sdp-us ]. [ ST2052-1 ] specifies the use of the DFXP Full Profile (see Appendix F.3 at [ TTML1 ]) supplemented by a number of extensions, including http://www.smpte-ra.org/schemas/2052-1/2010/smpte-tt#image. This specification defines practical constraints on [ ST2052-1 ], supplemented by a few extensions defined at F. Extensions. These constraints and extensions are intended to reflect industry practice. when the designator "http://www.smpte-ra.org/schemas/2052-1/2010/profiles/smpte-tt-full" is used as a value for ttp:profile element or attribute (see Section 5.8 at [ ST2052-1 ]), Text Profile or Image Profile is signaled by the Document Interchange Context and/or the Document Processing Context. [ CFF ] requires the use of the ttp:profile element, whereas this specification recommends the use of the ttp:profile attribute. The security and privacy considerations of [ rfc3023 ] and [ TTML1 ] apply, particularly in relation to document parsing. XML Entities are excluded from the Reduced XML Infoset of TTML and are therefore not considered part of Document Instances; nevertheless implementations are encouraged to provide protection against recursive entity expansion or prevent entity expansion altogether in processors. A user agent that selects, and causes to download or interpret a Document Instance, might indicate to the origin server that the user has a need for captions or subtitles, and also the language preference of the user for captions or subtitles. That is a small piece of information about the user. However, the offering of a Document Instance, and the choice whether to retrieve and consume it, are characteristics of the application that makes the offer (e.g. a web application based on [ HTML ]), rather than of the Document Instance itself. The Image Profile includes a mechanism for referencing external images. A user agent that downloads external images during media playback indicates to the origin server of the images the progress of the user's media consumption. In many cases such media progress information is available to the origin server of the media via other mechanisms, for example by scripting or by monitoring streaming media requests. User agents that do not enforce cross origin policies when downloading external images expose such media progress information and potentially other user tracking information to other origins without the consent of the web site serving the media and without the consent of the user. This specification defines no APIs and makes no statement on how implementations are expected to obtain referenced images. Consumer Technology Association. CTA 608-E, Line-21 Data Services. Consumer Technology Association. CTA 708-D, Digital Television (DTV) Closed Captioning. Digital Entertainment Content Ecosystem (DECE). Common File Format & Media Formats Specification (CFF) Version 2.2.